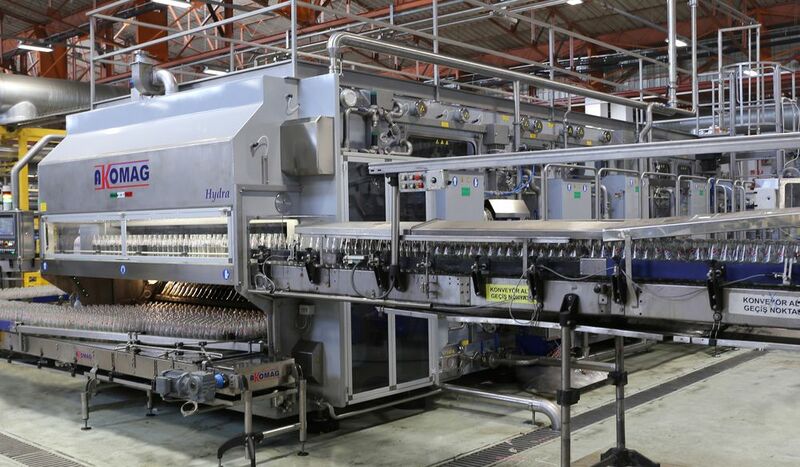 Hydra 8.2 reaches a speed of 37,500 bottles/hour in washing recycled glass bottles. Designed by Akomag and featuring an automated washing cycle, it reduces water and steam consumption. The band pass filter located in the pre-maceration area automatically removes the main impurities of recycled bottles. Internal and external high-pressure detergent wash sprayings are performed using self-cleaning and self-centering rotating nozzles. The bottles are thoroughly rinsed using sprayings at decreasing temperatures that accompany the bottles up to the final rinsing with mains water. A valve with an integrated flow meter on the supply pipe (controlled by the control panel) detects the instantaneous and daily water consumption for the correct washing of the bottles. Other features of the bottle washer are: sensors indicating a slowdown and stoppage in the event of the absence bottles or obstruction of the conveyors; synchronization between the machine speed and filling section; self-cleaning filters in the tanks; automatic loading and unloading of the bottles is synchronized with the movement of the main chain.